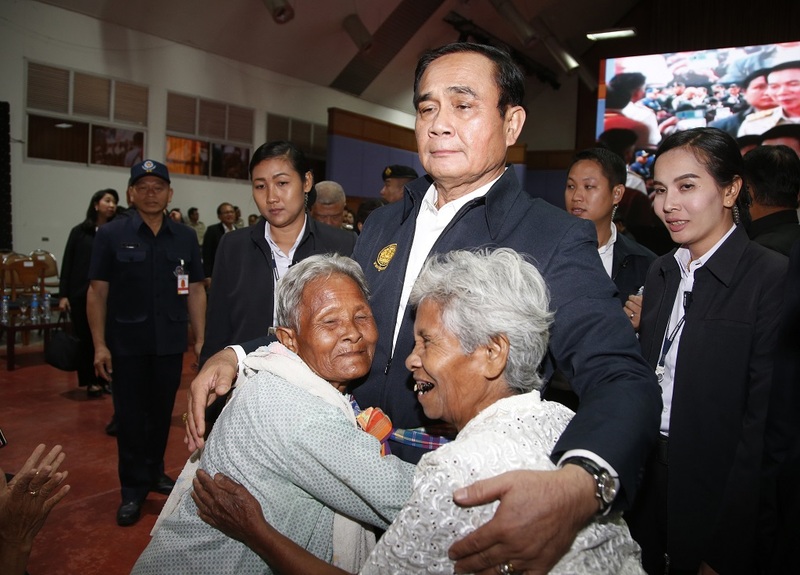 Nakhon Ratchasima, Thailand (AP) — Thailand’s military-installed prime minister crooned a love song and boasted of his government’s achievements Wednesday during an official visit to his home province in the northeast ahead of the March 24 election. Prayuth Chan-ocha led a 2014 coup ousting Thailand’s last elected government and is seeking this time to take power through more legitimate means. He appeared before a crowd of thousands on a trip that was nominally part of his official duties. The style of the visit closely resembles what many people would consider campaigning, and he has been carrying out such activities for several months. Supporters chanted “Stay on longer, Uncle Tu,” using his nickname. Prayuth greeted and took selfies with fans who came to welcome him, and he warmed to the hometown audience. Earlier Wednesday, he was greeted by a large crowd as he presided over the opening of a newly renovated train station in another northeastern province, Khon Kaen. Prayuth initially disclaimed any political ambitions after the 2014 coup. However, the Palang Pracharath Party nominated Prayuth as its candidate for prime minister and hopes it can form a government. Critics say new election laws enacted by his military government give Prayuth an advantage in the polls and make it difficult for political parties not allied with the military to form a government. Thai politics for more than a decade have been dominated by a battle for power between supporters and opponents of former Prime Minister Thaksin Shinawatra, who was ousted from office by a 2006 coup. The army and other conservative elements in Thai society, alarmed that Thaksin upended the traditional power structure by gaining unbeatable electoral majorities with populist policies, have sought to suppress his political machine. Thaksin went into exile in 2010 to avoid serving a prison term on a conflict-of-interest conviction, but his sister Yingluck became prime minister in 2011, only to be forced from office just ahead of the 2014 coup.